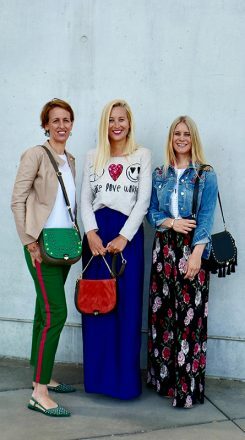 The Zoé Lu founders: Ulrike Heintz, Jennifer Rüggeberg and Larissa Walter (from left to right). The Munich startup Zoé Lu has created an interchangeable handbag. It’s not only meant to look good sporting its different designs, but also does its part in supporting sustainability. The three founders let us know more about how they plan to take on the competitive handbag market in our Seven-Question Interview. 1. Who are you and what do you do? Please briefly introduce yourselves and your product! We’re Zoé Lu and exclusively “women of action.” The creative trio is composed of true fashionistas, each with a very different focus and character, who came together to create Zoé Lu. We know each other from working together as designers for Marc O’Polo. We got together for the first time three years ago to think about a product that would be fun for us and also sustainable, of high quality and genuinely new. As bag designers, all three of us were definitely a bit frustrated by having to create designs that weren’t really innovative for well-known brands season after season. Our product is an interchangeable bag made of premium quality, Italian cowhide. It looks like a “normal” handbag at first in a classic saddle bag design. But the idea behind it is “one bag — many looks”: The body of the bag can be mixed and matched for any occasion. Our interchangeable flaps, which are now available in more than 20 different designs, can be instantly switched out thanks to a zipper on the back of the body of the bag. 2. But that’s already been done! Nope. Not in this form — meaning one that unites functionality with feminine design. And that’s something we’re really happy about. That makes us the first in the world to offer a stylish saddle bag for different occasions. Like we said already: “One bag — many looks”: The motto perfectly summarizes what we do. And our philosophy is a perfect match for current times. That’s because we’re doing something for sustainability at the same time and combatting the throw-away mentality. We don’t make one-season products like the major players in the industry with their multi-million advertising budgets. Instead, we make a faithful handbag according to the highest standards of quality whose look you can change in a matter of seconds. 3. What was your biggest challenge so far? It was actually fine tuning our first idea. All three of us quickly had a clear idea of the how design and functionality needed to work together. It was also a challenge to find reliable suppliers whose leather met our demands in terms of quality and sustainability and who, most importantly, were willing to produce very small quantities in the beginning. After several attempts, we fortunately found some excellent partners who are just as excited about our product idea and want to grow along with us. 4. Now let’s get down to the nitty-gritty: How is business going? We started out super-euphoric and concentrated mainly on classic sales through retailers. But as we stood there during the Berlin Fashion Week in 2018 at our stand that we had paid a lot of money for and none of the retailers wanted to make us a part of their product range, it was pretty tough. Everyone thought our product was great, but they also all said it would be difficult to include us in their range because we were so unknown. Unfortunately, retail in Germany is not very open to new labels. Especially when it comes to handbags, buyers often bank on the big players in the fashion business. So that was why we got more involved with influencer marketing. We now have some fantastic partners who love our product and their features are enthusiastic as a result. Things have improved progressively since and our sales have been increasing steadily. Zoé Lu now has its own committed community. Our fans include actress Ursula Karven and the influencers Susamamma, Beautyrella, Kira Bejaoui and Fifteenminfame. By participating in the show “The Thing of the Year” (Das Ding des Jahres) on March 5, we’re also hoping for an additional boost in recognition. 5. What does Munich mean to you? Home! Even though one of us chose to make it her home. 6. How will your startup become the next unicorn? Or will we be seeing you at an Epic Fail Night soon? Epic fail — no, definitely not. We already did that years ago with a different startup. This one will definitely be a unicorn! 7. Hiking or beer garden? Hiking first — then the beer garden! Transforming Mobility – 7 questions to… SPLT!